"This is a great way to use every part of the fresh beets you buy. You can get two delicious side dishes out of this one vegetable." Preheat the oven to 350 degrees (175 degrees C). Wash the beets thoroughly, leaving the skins on, and remove the greens. Rinse greens, removing any large stems, and set aside. Place the beets in a small baking dish or roasting pan, and toss with 2 tablespoons of olive oil. If you wish to peel the beets, it is easier to do so once they have been roasted. Cover, and bake for 45 to 60 minutes, or until a knife can slide easily through the largest beet. When the roasted beets are almost done, heat the remaining 2 tablespoons olive oil in a skillet over medium-low heat. Add the garlic and onion, and cook for a minute. Tear the beet greens into 2 to 3 inch pieces, and add them to the skillet. Cook and stir until greens are wilted and tender. Season with salt and pepper. 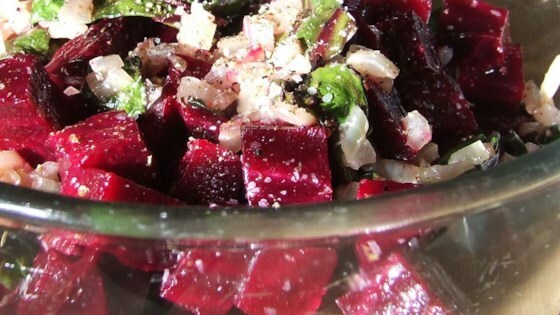 Serve the greens as is, and the roasted beets sliced with either red-wine vinegar, or butter and salt and pepper. A foolproof method to cook beets and beet greens. I had never been a huge fan of beets, but we grew some this year and I used this recipe- WOW they were awesome!! Have made many times already. Thanks!! Delicious idea using the whole beet. Beets are moist and tasty, the greens are flavorful (similar to swiss chard) and add color. This is a great basic recipie.